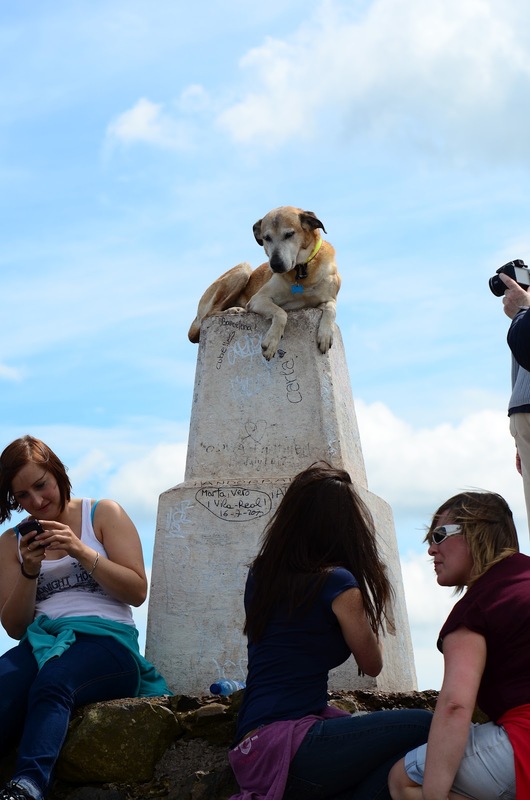 We are trying hard to reach the summit in time. But we are late. 350 million years late, to be exact. This volcano stopped breathing before the dinosaurs came to life. 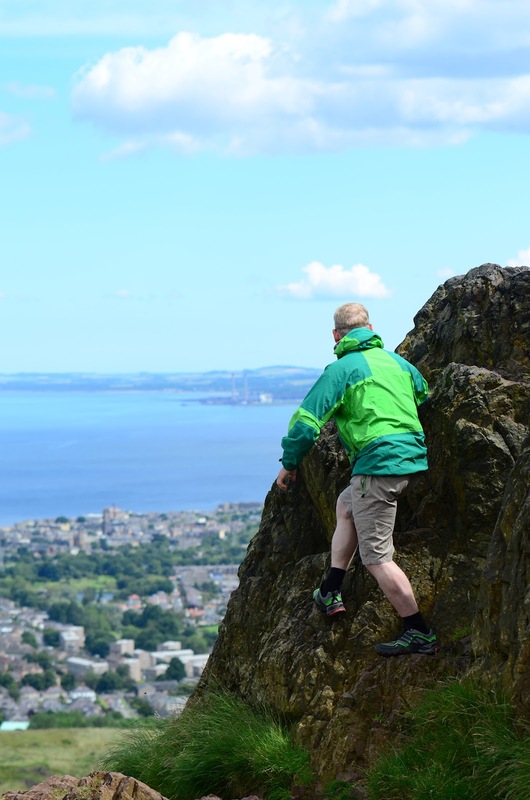 I am in Edinburgh this week, and to my surprise, I found out that there is an interesting hike to the top of an extinct volcano, Arthur's Seat, right in the middle of the city. A good place to start the trip is on the parking lot near the Scottish Parliament house. 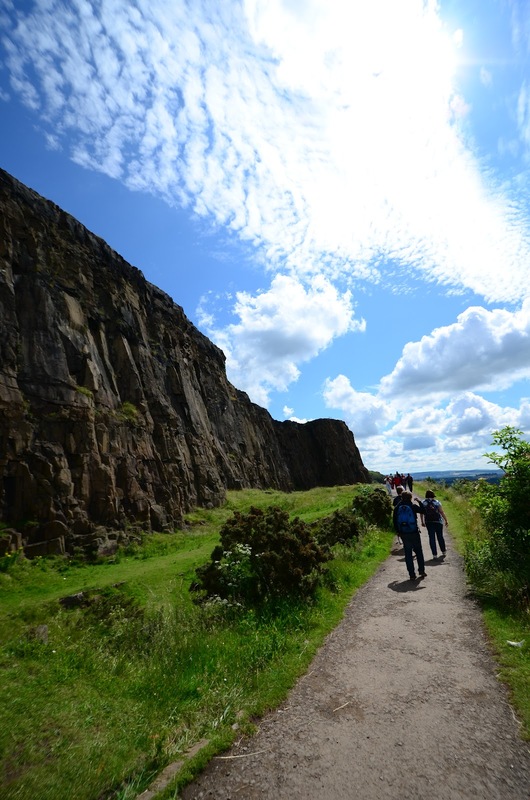 Be sure to visit the ruins of the St. Anthony's Chapel near St. Margaret's Loch on your way up or down the mountain. The ruins are very beautiful. Just behind the ruins there is also a small cave; look to your right above the lake. 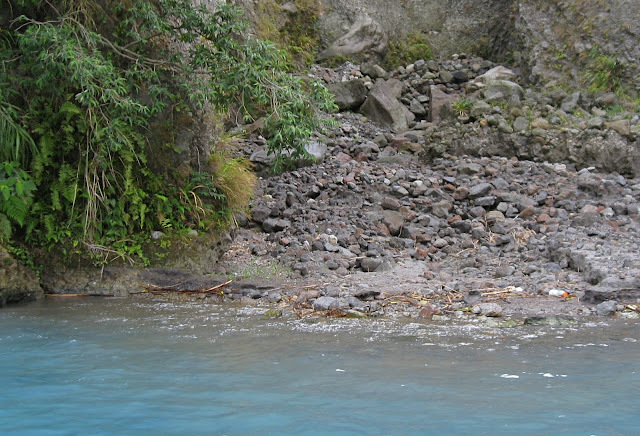 In any case, the volcano is cold, no craters can be identified, and there are no lava flows. 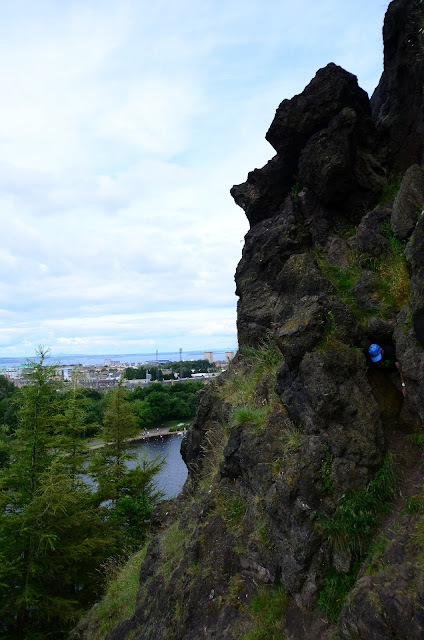 Still, the rock formations are interesting and the views superb. To have such a mountain right in the city is exceptional. This experience inspired me to write about some of my earlier adventures in climbing volcanoes, some which have been on more exciting volcanoes. I considered Mt. 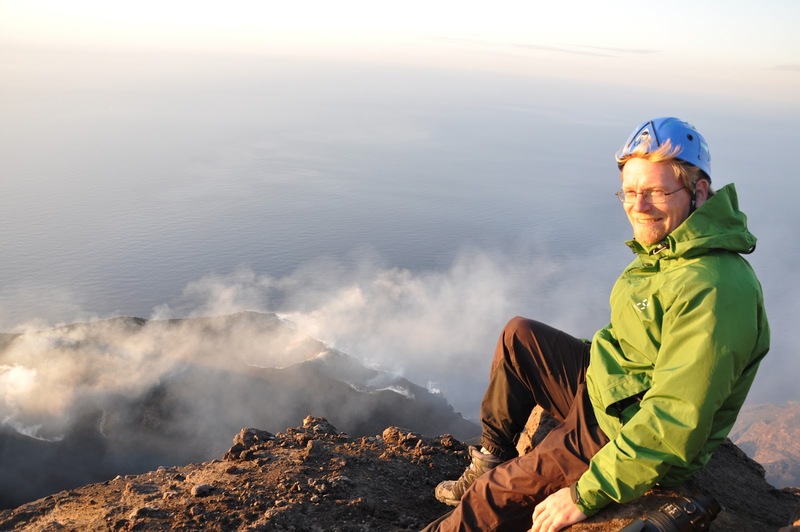 Mayo, an active and beautiful volcano. However, I ended up choosing a visit on the infamous, but momentarily quiet Mt. 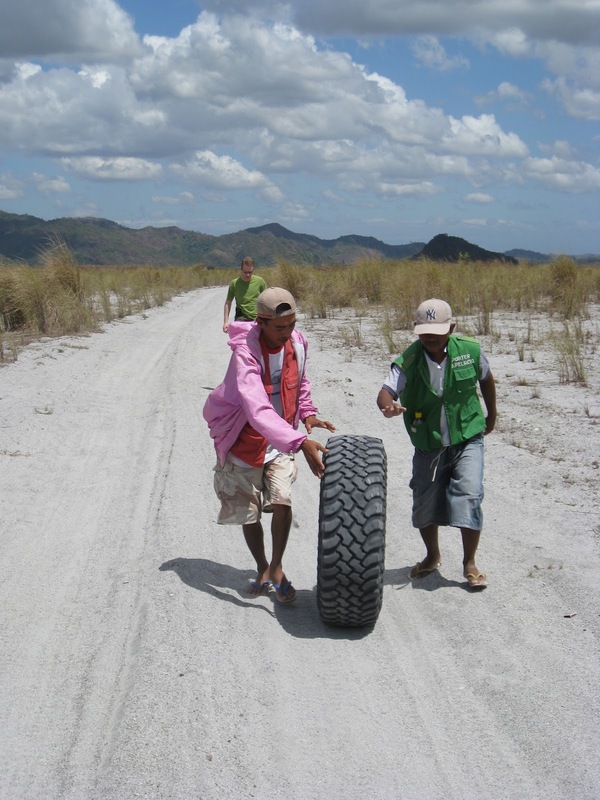 Pinatubo instead, as there were access restrictions to reach the summit of Mayo. As everyone knows, Mt. 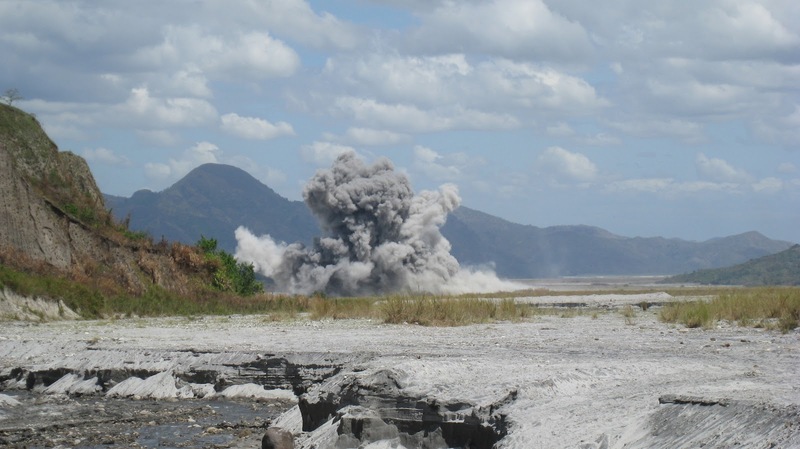 Pinatubo erupted with catastrophic consequences in 1991. The trip started from congested Manila. 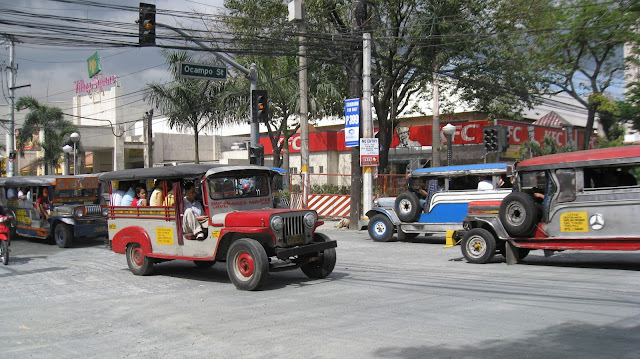 There were plenty of "Jeepneys", unique conversions of Jeeps to public transports. Even if Mt. Pinatubo is only 80 kilometers from Manila, the traffic and road conditions can easily lead to spending three hours just to get to drop-off point. 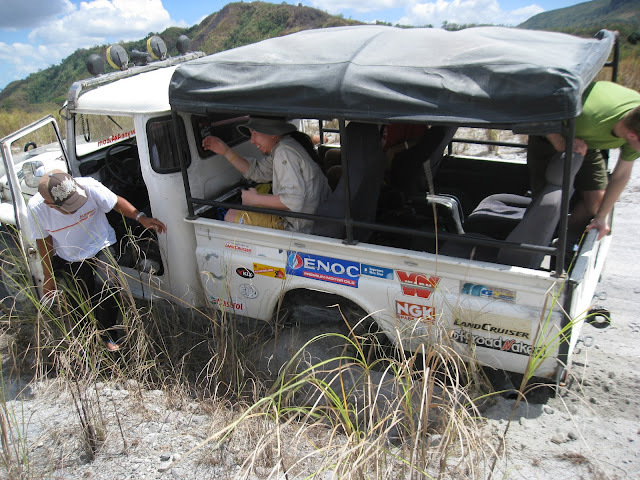 We used 4x4 vehicles to carry us nearer the mountain within the reservation. 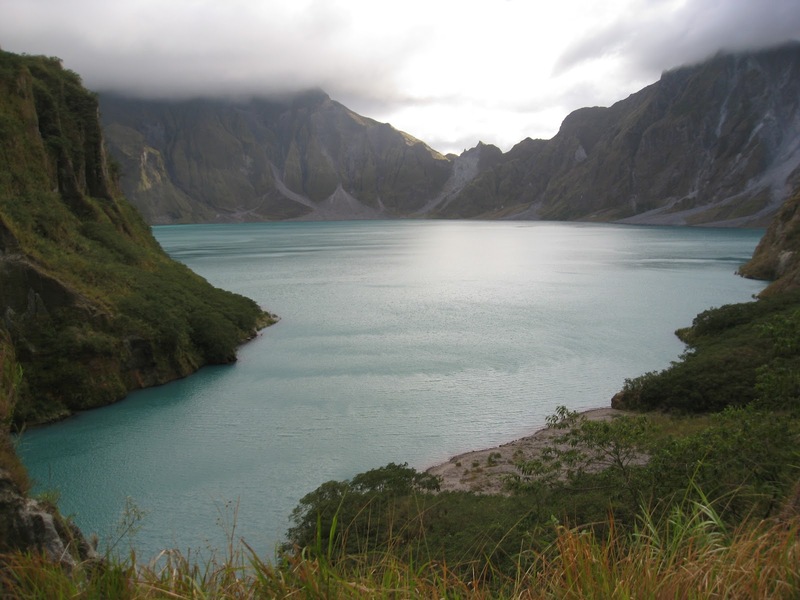 The area around Pinatubo is a mixture of hills, rivers, and sand fields. We must have crossed the same river 50 times going towards the mountain. Eventually the path became too narrow even for the 4x4 and we had to start walking. 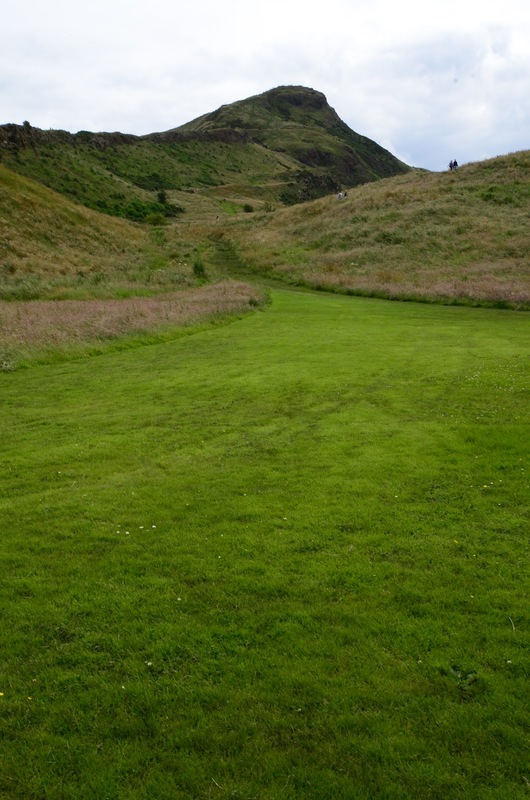 There are several paths to get to the crater. We followed the river, which was about a three hour walk. On return trip we we used a shortcut that takes under an hour. The hills around the river consisted mostly of packed sand and ash. 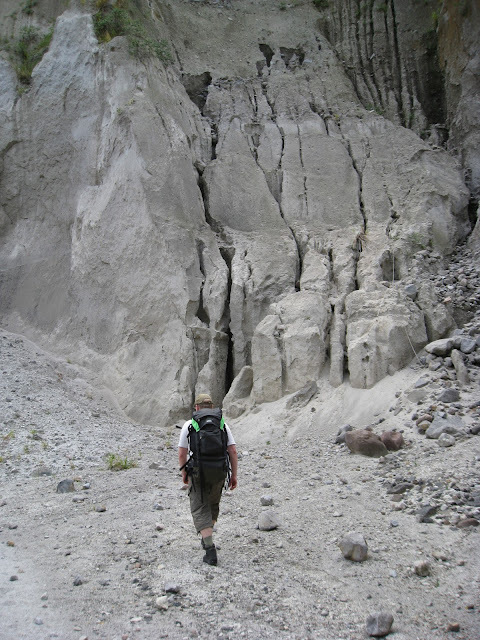 This is an entirely new environment and rains can easily cause lahar flows, slides, or even the collapse of parts of the mountain. 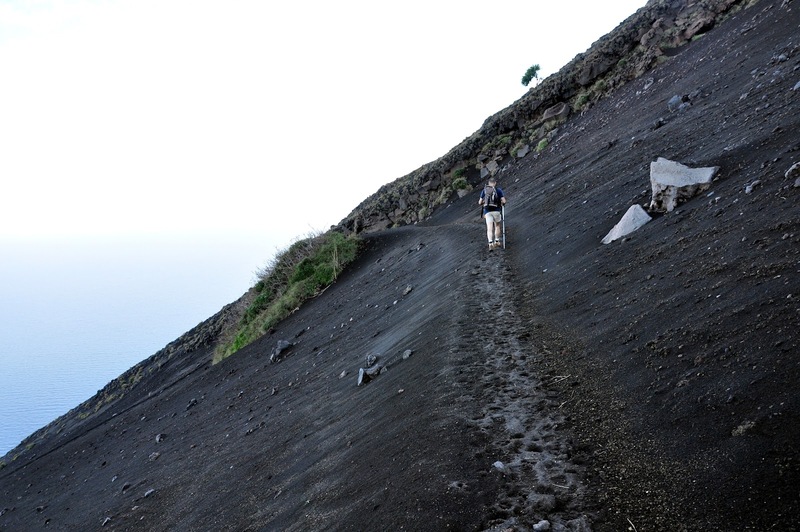 The hike with a heavy backpack was tough, but eventually we made it to the crater wall. Beautiful views greeted us. In particular, the colors in the lake and the surrounding walls were magnificent. I planned to spend the night in the crater, so I had a tent with me. 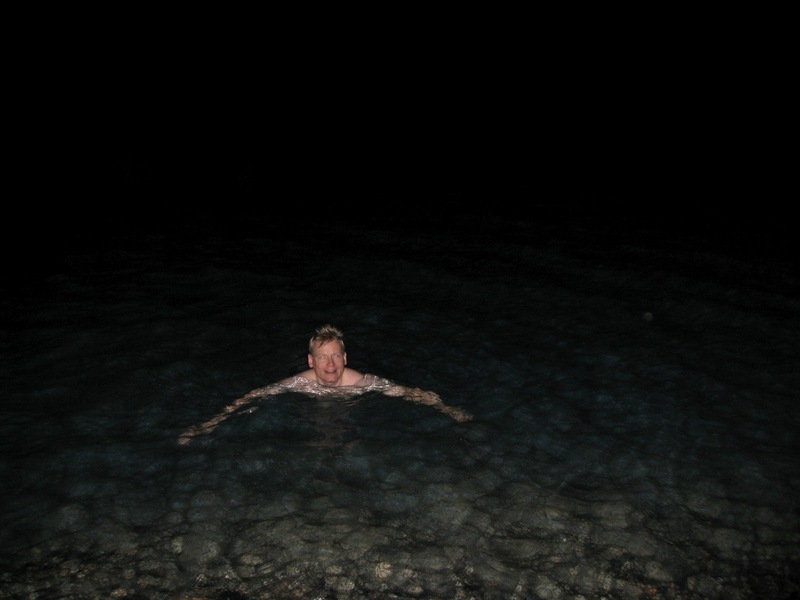 I also took a swim the crater lake. The water was pleasant, not too cold. But on the other side of the lake there are places were the water is actually boiling. We used a small canoe to explore other parts of the lake, and were hoping not to fall over, as the water can indeed be quite hot. The water on the shore is boiling. Do not tip over in the canoe here! The crater seemed to have almost permanent clouds couple of hundred meters on top of the lake level, hiding the highest crater walls. This may be due to the hot steam rising from the lake. It was hard to believe that just 17 years ago this was an inferno. The crater is green, blue and silent. 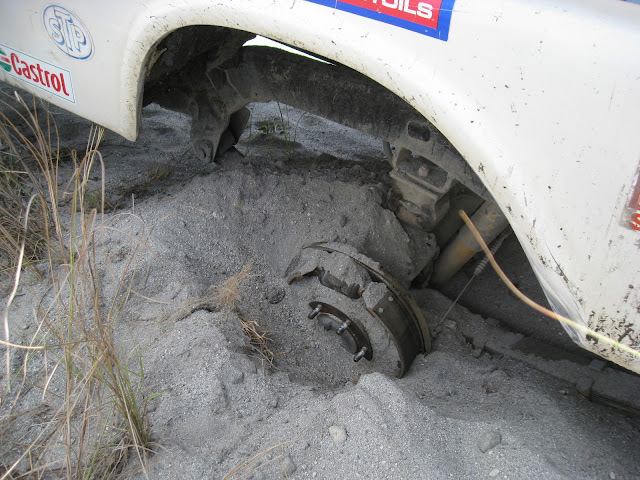 On our return trip, there was plenty of excitement in addition to the bombs... we were on the sand plains, probably doing 50 km/h when the vehicle suddenly drops on its side, and I see the back wheel run past us. The wheel has come off! We were lucky that this happened in this place, on some of the steep mountain roads or river banks this might have caused the vehicle to turn over. That would have been very bad, as we were sitting in the back of an open truck. It was surprisingly hard to find the missing wheel, it took several minutes to spot it. On closer investigation, the threading had come off from the bolts. The vehicle was probably used day in and day out on the same route, taking constant beating. The wheel has come off! But no problem, our 11-person expedition had two vehicles, so those of us who did not have to stay with the broken car loaded ourselves on the other one and headed back. All seats in this vehicle were taken, someone was even sitting on top of the hood. There are several guides that can take you to Mt. Pinatubo. 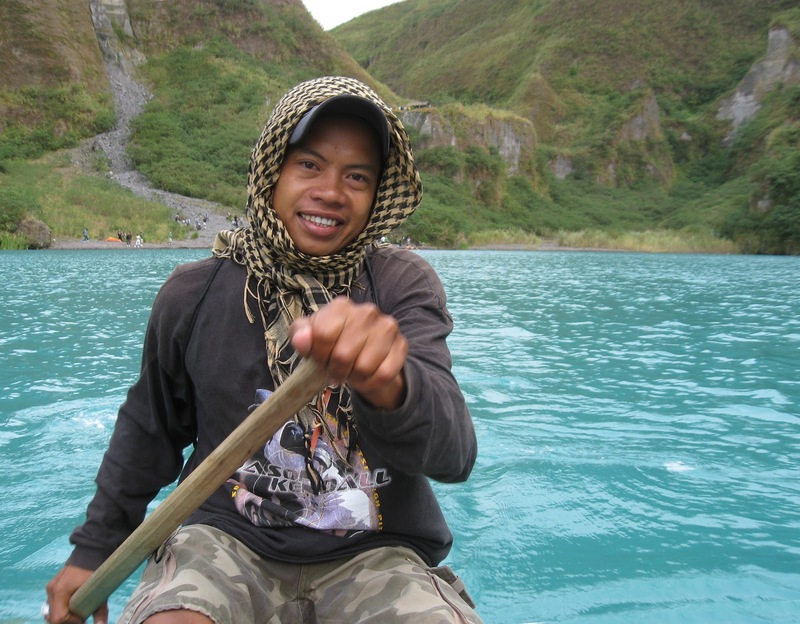 I used e-Philippines Adventure Travel and I was generally very pleased with their service. Recommended. It was like a scene from the Lost TV series. I woke up after a boat ride and found myself on tiny tropical island with an overwhelming volcano almost pushing a tiny village to the sea. Smoke was coming out from the mountain. Can this place really exist in Europe? 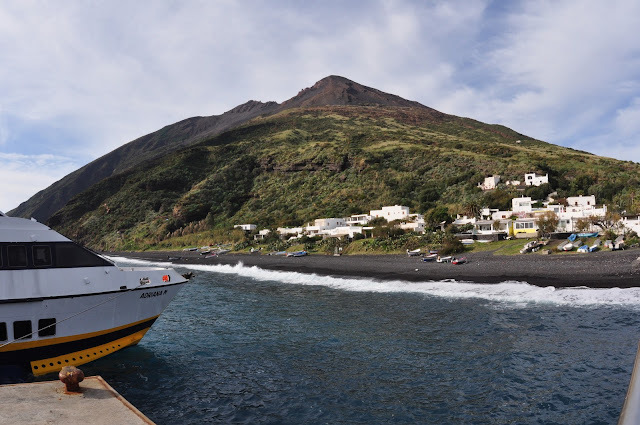 I was in Stromboli, one of the Aeolian islands off the coast of Sicily. I had flown to Sicily for a couple of days for some volcano fun. Straight after arrival, I drove from the airport to Etna and climbed to the top despite various difficulties (bad visibility, ongoing volcanic action, missing the lift down, being alone in the night on the mountain, etc). Maybe not the wisest climb that I've ever done. 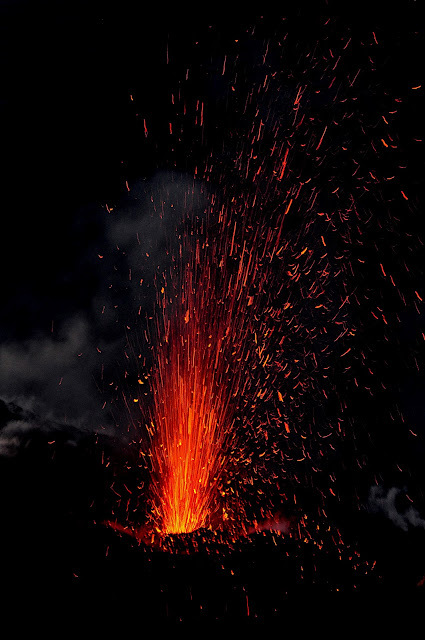 But that was just a warm-up for the real goal of the trip, to see the wonderful lava fountains of Stromboli. Stromboli is perhaps the destination for the travelers who are interested in volcanoes but not too keen on extreme mountain climbing or going out to unstable environments. 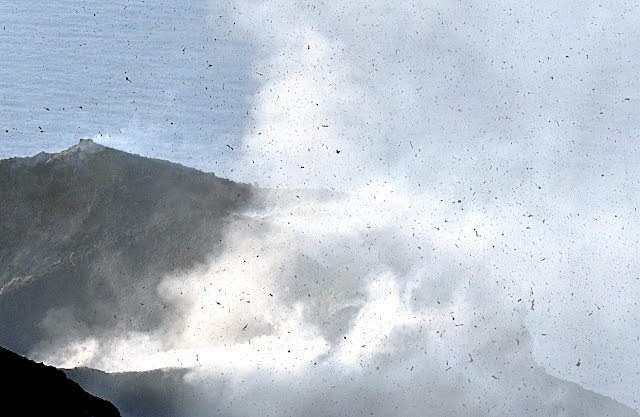 Stromboli spews 100-meter lava fountains every couple of minutes, but is still relatively safe and easily reachable. To get to Stromboli, you have to use one of the boat lines that runs through the Aeolian islands. I took a boat from Messina, and booked a guide with Magmatrek, the main local climbing company. You can find their offices next to the church. Contacting them over the Internet or via phone in English can be difficult, however. 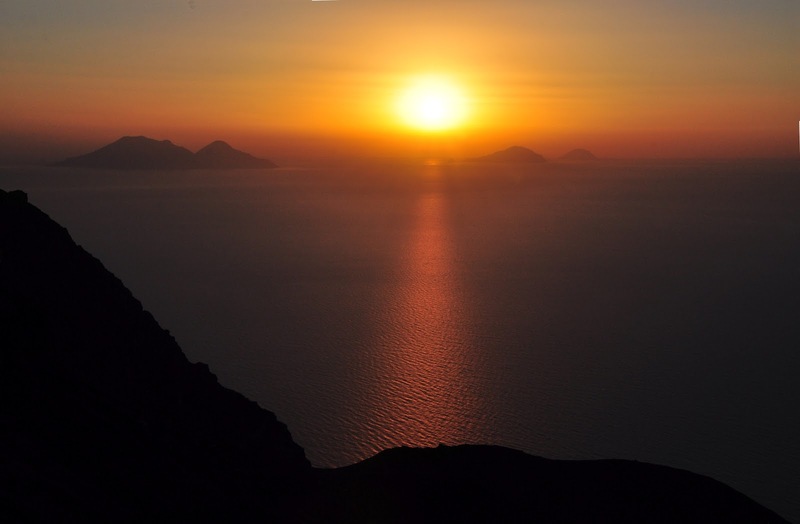 The climb to the summit begins from the tiny village between the mountain and the sea, in the afternoon. 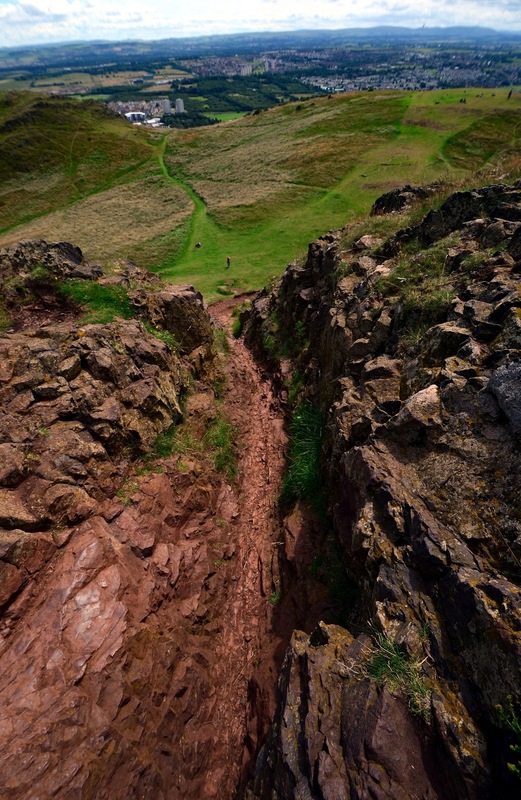 You have to climb a vertical kilometer, but other than that, the walk is easy. 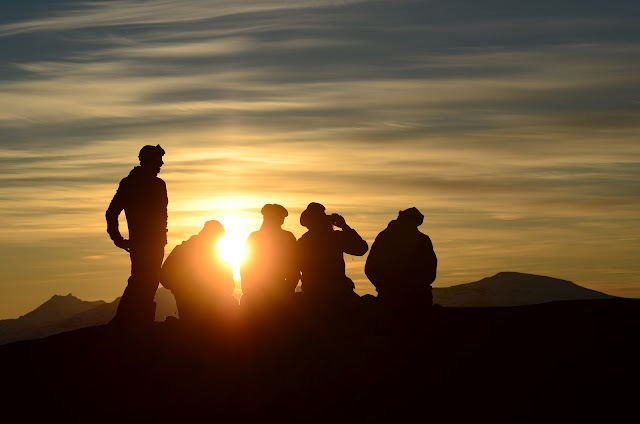 The idea is to arrive right before sunset, so that you get to see the wonderful colors of the sunset, and then get to see the lava fountains in darkness. The sounds and scenery are exceptional even during the day, but in the night the experience is out of this world. This is why you need a helmet. 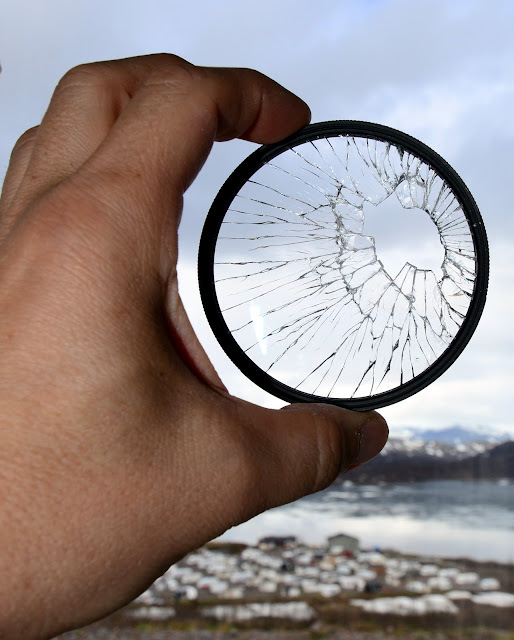 That is not dust on the lens, it is freshly brewed stones flying around. Once the guides tell you that it is time to go down, you will descend the mountain by jumping down on soft ash for about half a kilometer. 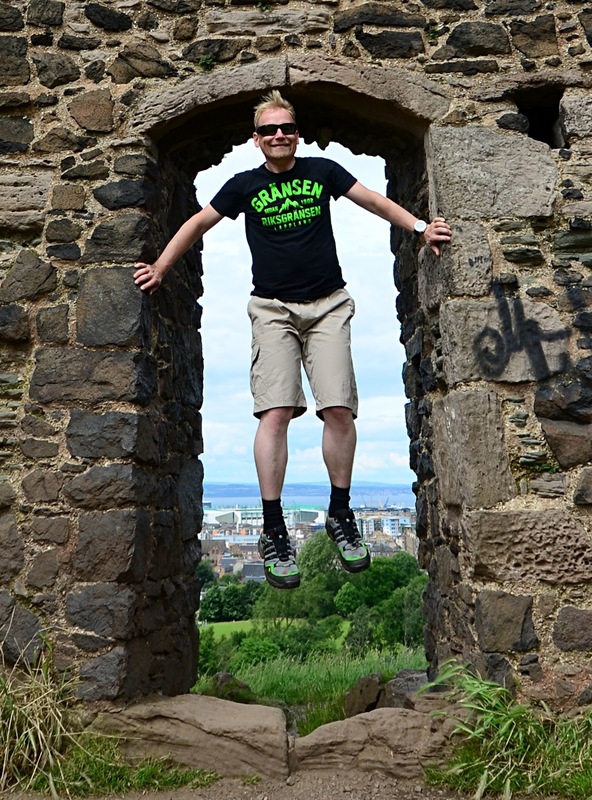 This can be a lot of fun, but don't count on having any dust-free items on you afterwards. 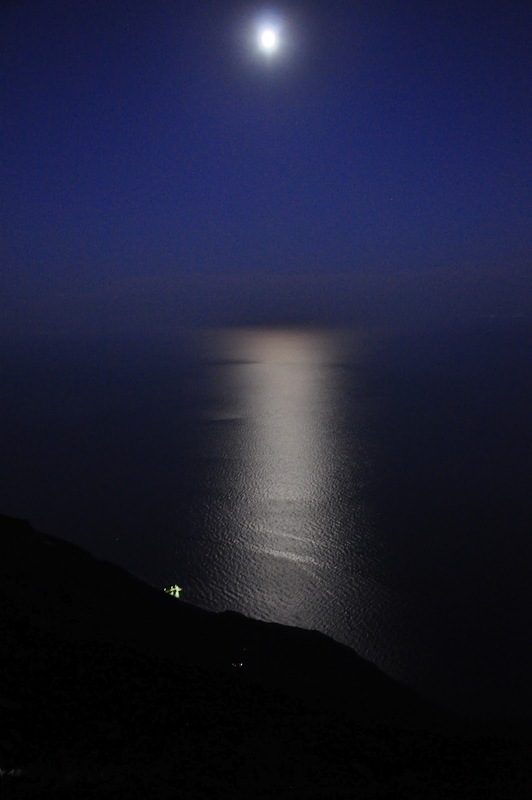 If the sky is clear, the view of the moon on the sea is very beautiful. 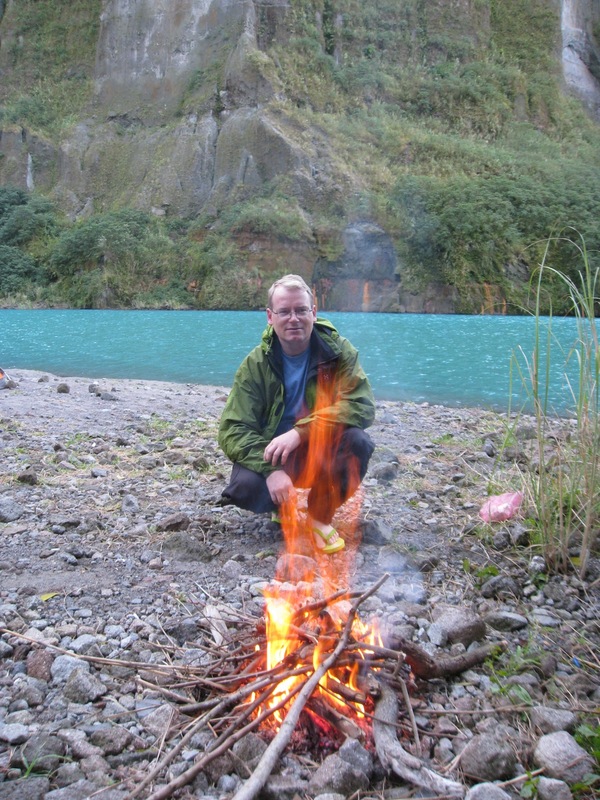 I have more stories on volcano tours. But I'll save them for future articles. Note that there are many skiable volcanoes as well, e.g., Etna, Mt. 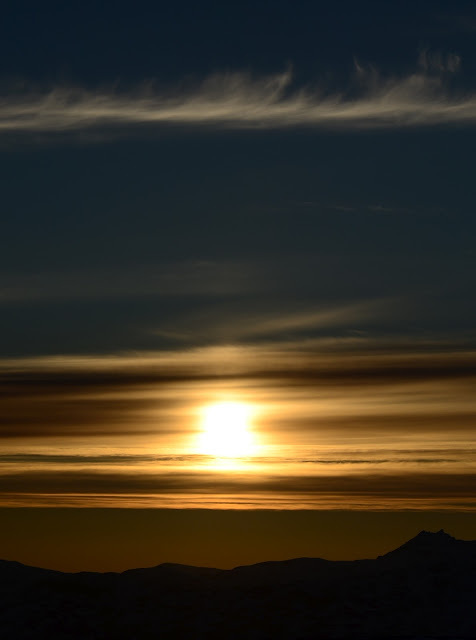 Ruapehu in New Zealand, Chillan in Chile, Mauna Loa in Hawaii, and Mt. Shasta in California. And on my upcoming trip to Argentina I hope to find some more! I like skiing, and my youngest son likes to visit aviation museums. 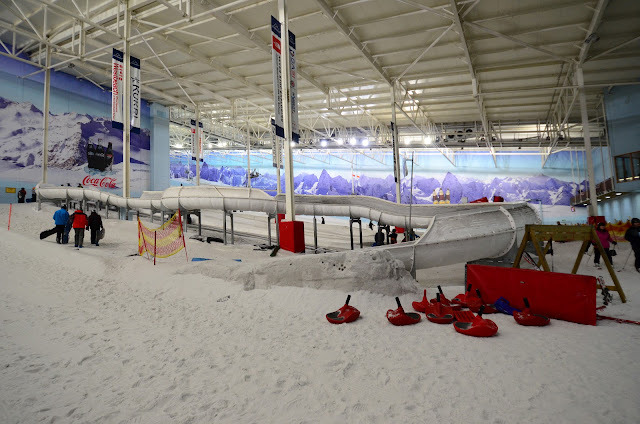 When I booked a family trip to UK, both two randomly selected cities that we are staying at turned out to have an indoor ski hall and a museum with Concorde. What are the odds? We are also lucky in that we can escape the rainy weather in Finland and UK and spend time in the beautiful mountain landscape (below). I'm at the mountains! Really! We are at the Chill Factore, a 180-meter indoor ski slope near Manchester, UK. Seriously though, while this ski area is indoors and small by world standards*, our visit there was a lot of fun for three reasons. 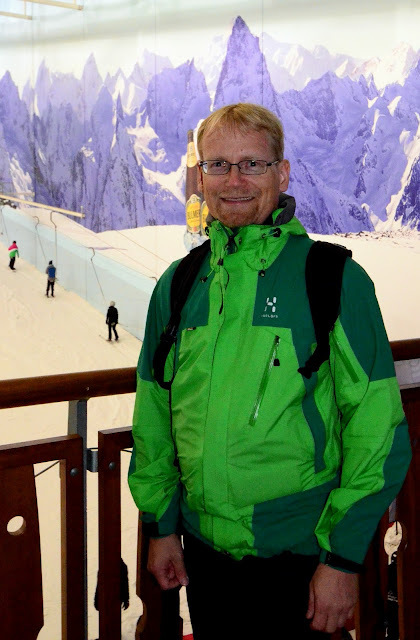 *) I recently visited a 600-meter indoor ski slope in France. First, most indoor ski hills are relatively flat. Chill Factore is not steep compared to outdoor ski hills, but it is markedly steeper than many indoor ones. 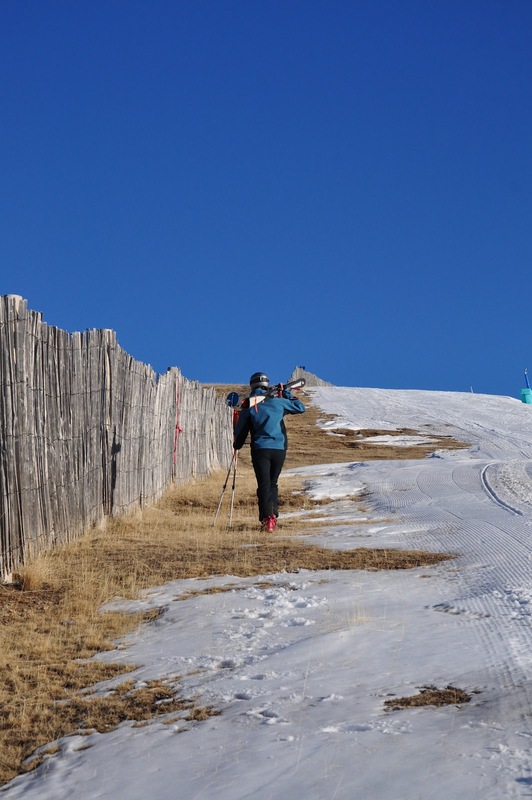 For instance, the long slope in France was probably the most flat ski slope that I have ever seen. Second, they had a moguls course! While I've seen some indoor ski hills that have one, this one was again markedly more difficult than the others. I am lousy at skiing bumps, but I ski easy courses at some speed. Here I found the skiing challenging. And finally, I've never skied in UK before. This is country #31 on my quest to ski everywhere. 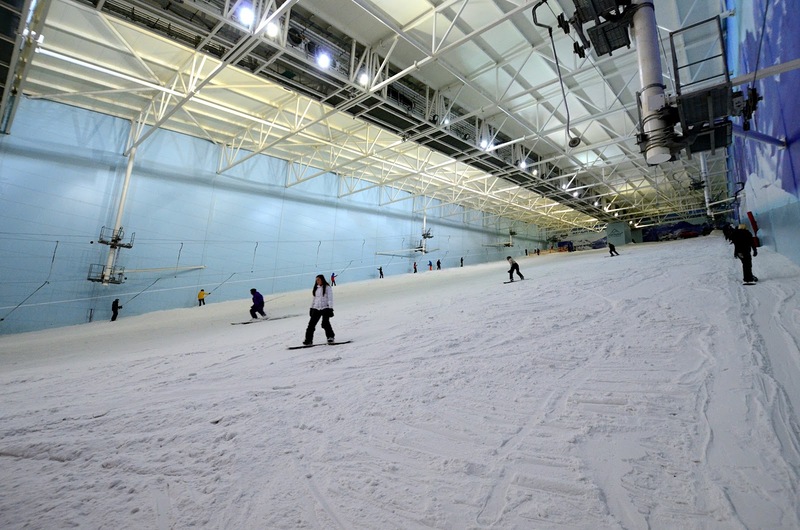 Chill Factore has just one main ski slope. In addition, there is a very small beginner's slope, a tubing area, and a luge. The latter seemed like a fun thing to try. 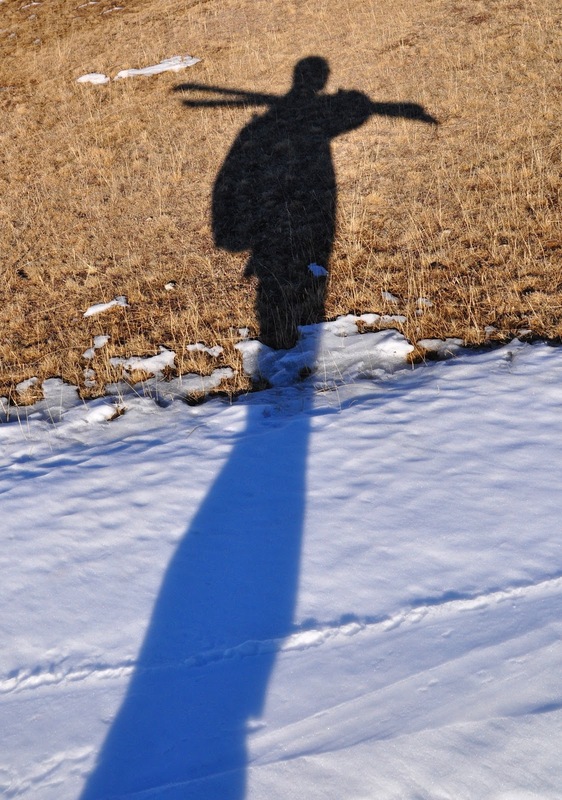 I wish there would have been more time for me to do so, but we were running out of our allotted snow time. 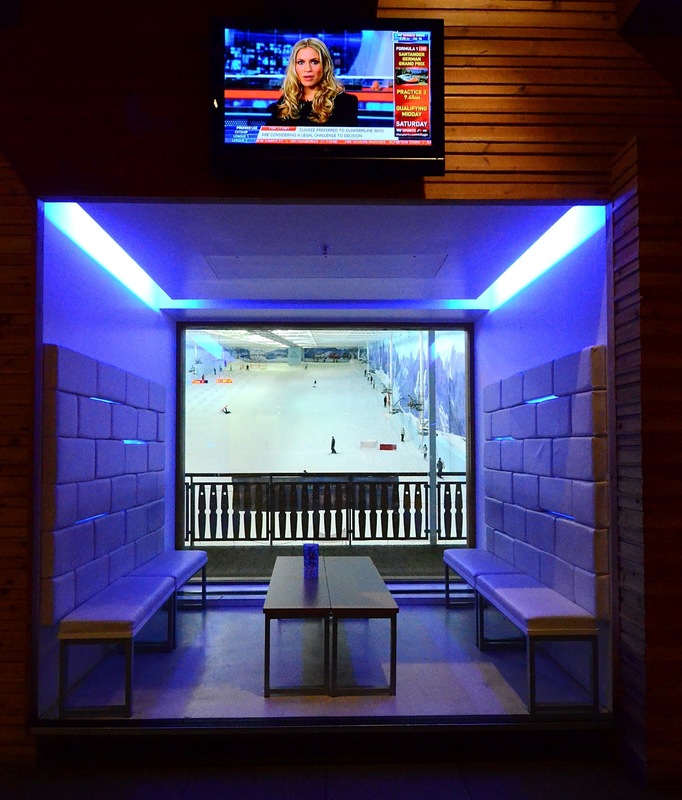 Chill Factore has an annoyingly commercial and rigid reservation model. Or maybe they are just too popular to do it in another way. They recommend making reservations and buying tickets for a specific time beforehand. Interestingly, back in Finland when I made reservations for a 7:30 pm ski session at this place, the web site happily let me make the reservation. But when I showed up, it turned out that the reservation system displays local time, not UK time. So we were about two hours late from our reservation. Luckily the staff was friendly enough to change the tickets to the correct time. I must also say that this is the first time that I have seen an emergency fire exit in the middle of a ski slope. At the top of the hill there is a small rectangular building that allows the skiers to exit to safety, should the snow start burning. 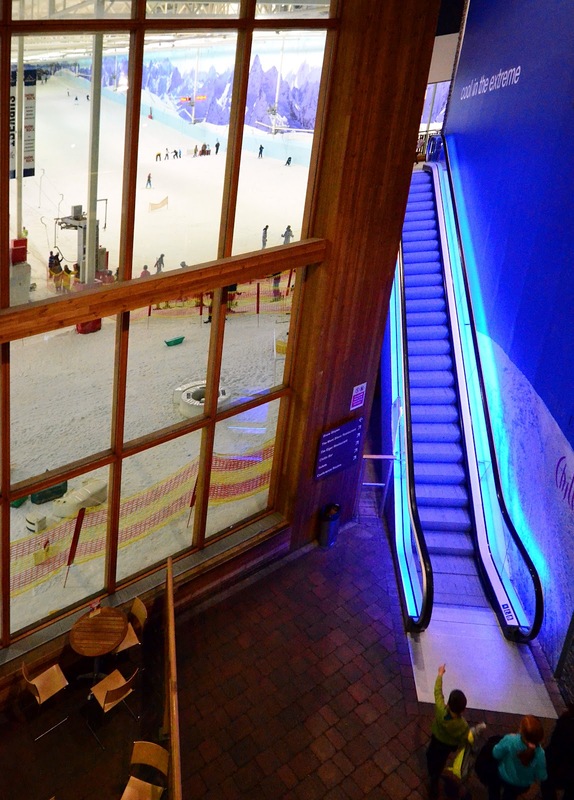 Visually, most indoor ski places are an eye sore. 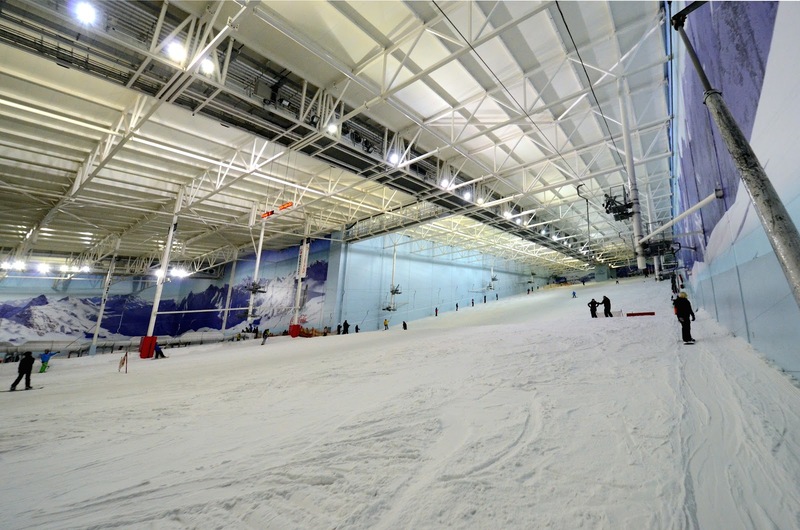 Along with the Dubai ski slope, Chill Factore makes an exception. The building is modern, attractive, and well maintained. As one example of this, at the entrance to the ski slope from the mall area, there is a large window, a viewing terrace, and nicely lit escalators to the after-ski and restaurant area. 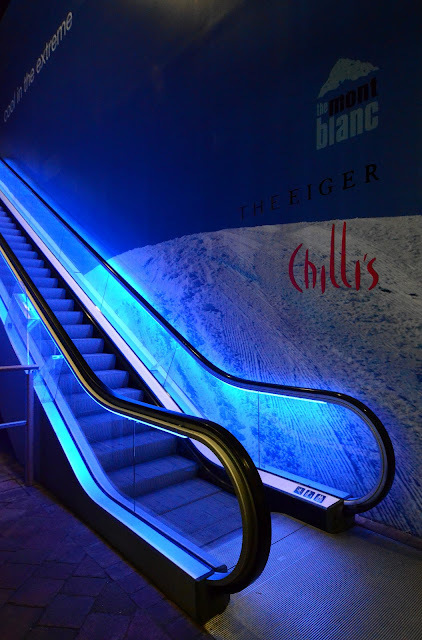 I did not have time to test the after-ski, but it was clear that the most interesting after-ski happens at Chilli's, a bar on the second floor above the bottom end of the ski slope. Chilli's has an outside terrace and excellent views even from the inside. They serve both drinks and food. The brunch options looked inviting for 2.50 £, and the most expensive meal, a warm sandwich, costs only 4.25 £. They do not serve anything complicated, but the pricing is reasonable for UK and for a ski area. 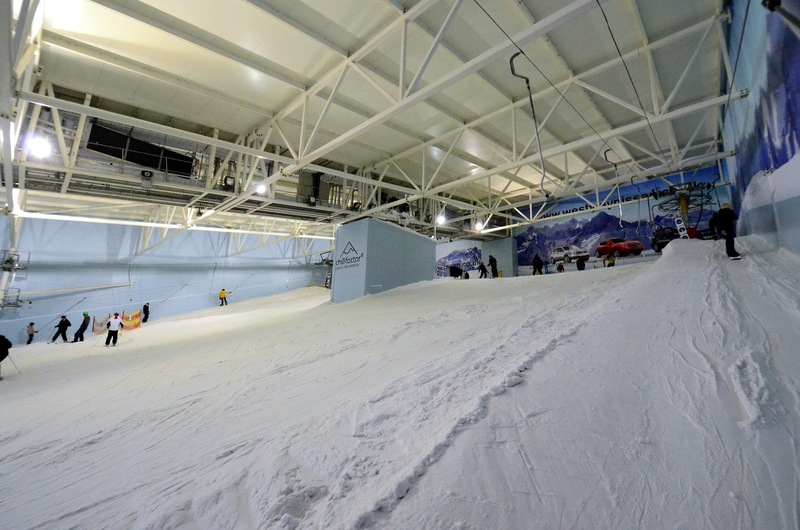 Chill Factore is small, but one of the most fun indoor ski areas that I have visited. This is mostly due to the moguls run, and the luge and tubing sections. 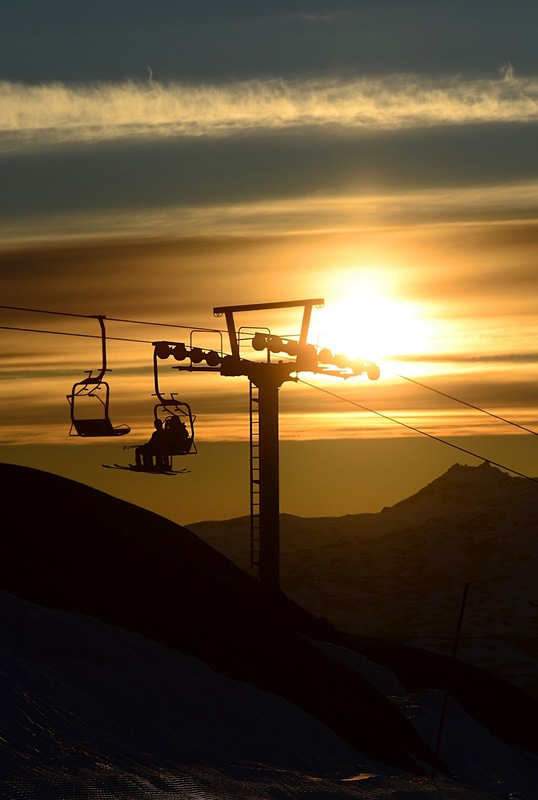 It takes about 15 seconds to ski the slope, and typically about five minutes to get back up again. 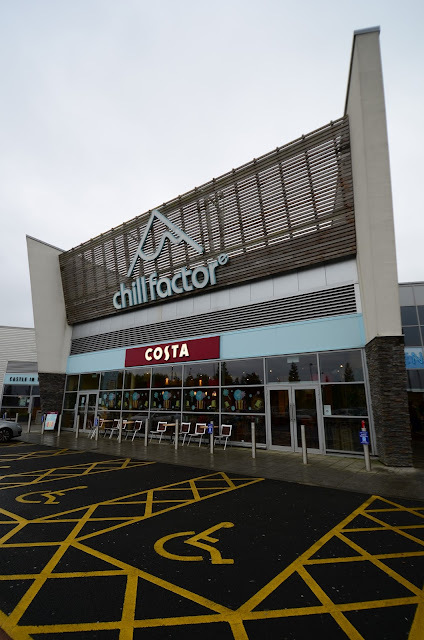 Chill Factore is at a small shopping mall in the Trafford Quays Leisure Village, six kilometers from Manchester city center. I came from the airport by taxi, and paid 20 £ for this 20 minute trip. There are several other attractions nearby as well. For instance, Airkix, an indoor sky diving establishment may be interesting. 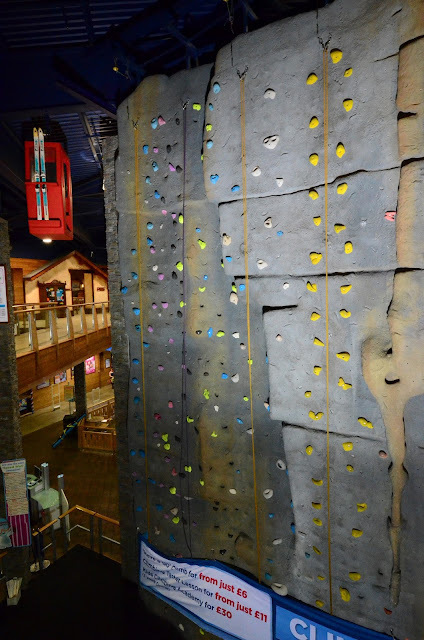 There is also a climbing wall. 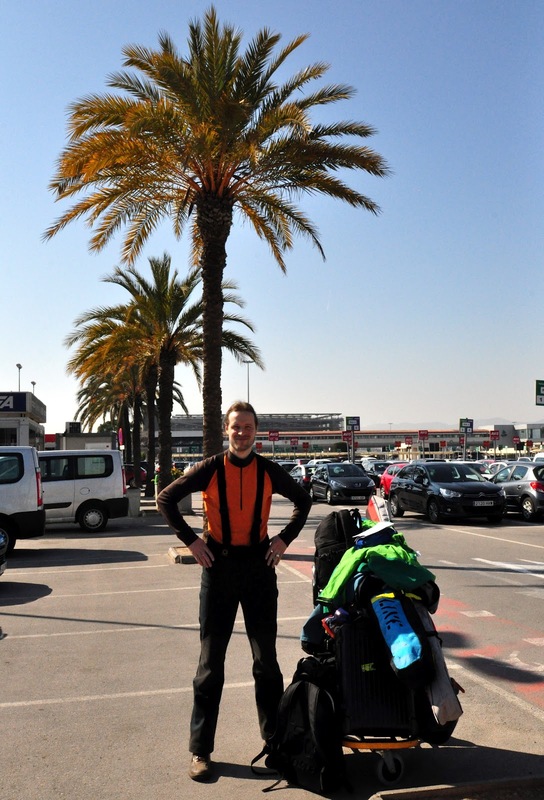 To boldly go where no skier has gone before: Spain. And the really tough guys dress in ski clothes on the plane bound to Barcelona (not me). Anyway, I ski a lot. 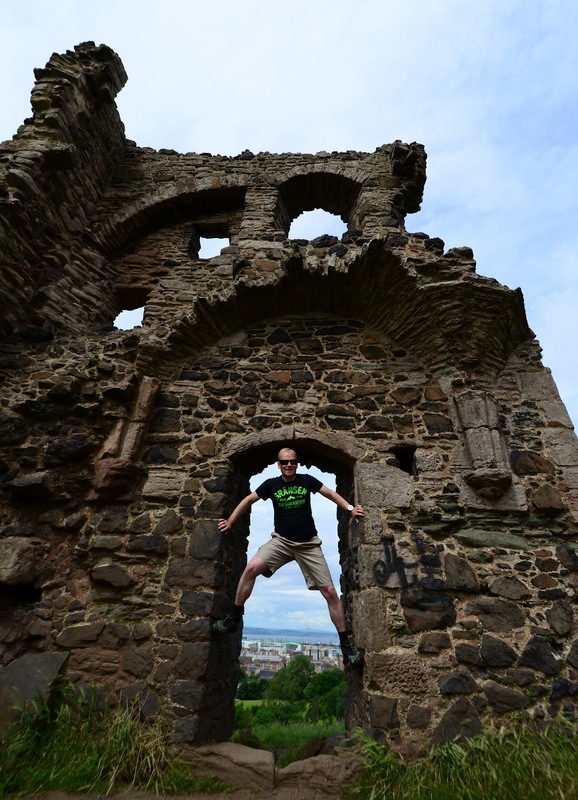 Almost too much to keep up writing articles about my trips. I often have a handful stories that I have not found time to write about. Like this one. In February we went to Spain and Andorra. At the time I only had time to write the all-important after-ski article. From just one of the bars that we visited. But now I have found time to describe our short visit to La Molina in northern Spain, a stop on our journey towards Andorra. Our trip lasted just two and half days; a weekend. 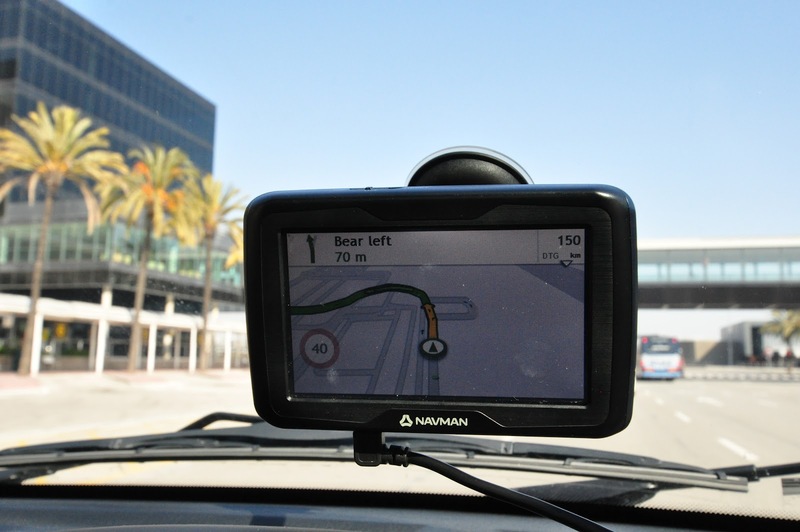 We were pressed for time to visit all the places we wanted to. When we arrived at La Molina they were still open for an hour, which we figured would be enough to tour the most important parts of this medium-size area. Oddly enough, however, the ticket office refused to sell us tickets. The sales agents were still in their booths, but no, they were unable to sell us a ticket at this time. They cared about their customers not getting enough of their money's worth if a day ticket would only be usable for an hour? The "Mañana" (tomorrow) attitude or something else? We don't know. 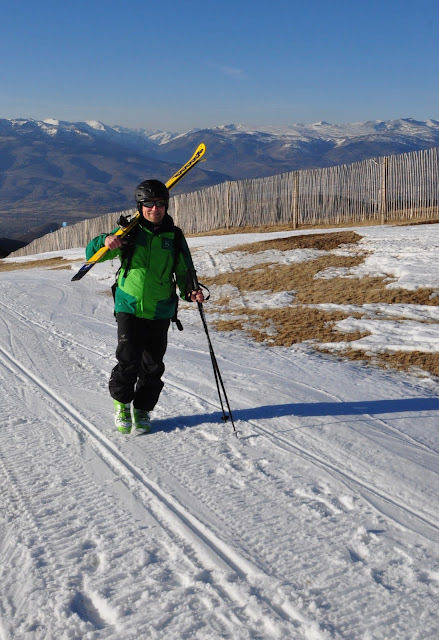 Even though it was February, the snow cover in La Molina was limited. 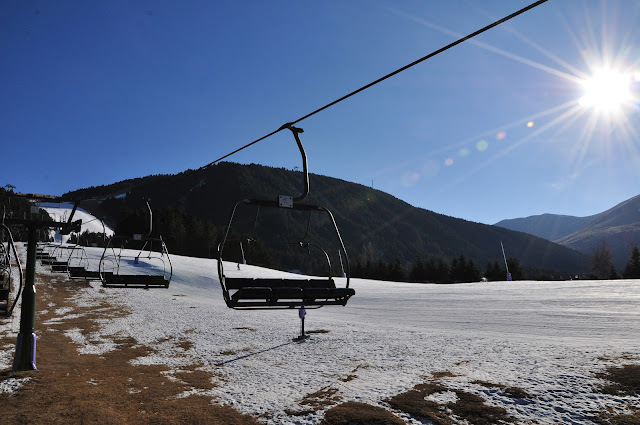 Most of the ski area is above two kilometers, at a comparable altitude to the mountains of Andorra. But there was a world of difference between the two places. Andorra looked like an entirely snow covered, remote mountain region. La Molina looked like a tiny snow cap on top of mountains rising from the desert. And in fact, that snow cap was man-made. There was no snow outside ski runs at La Molina. But the snow year had been difficult. Nevertheless, we found some good skiing. 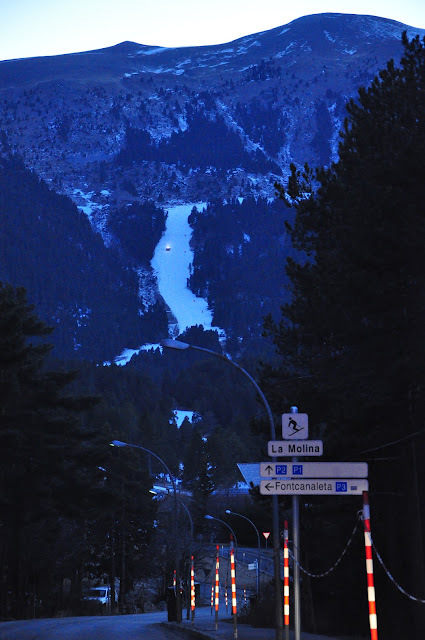 On the map and on site, the Tosa d'Alp mountain on the right hand side from the parking lot looks more challenging. Use the Telecabina Alp 2500 to get to this area. You can get up to 2445 meters on this side. 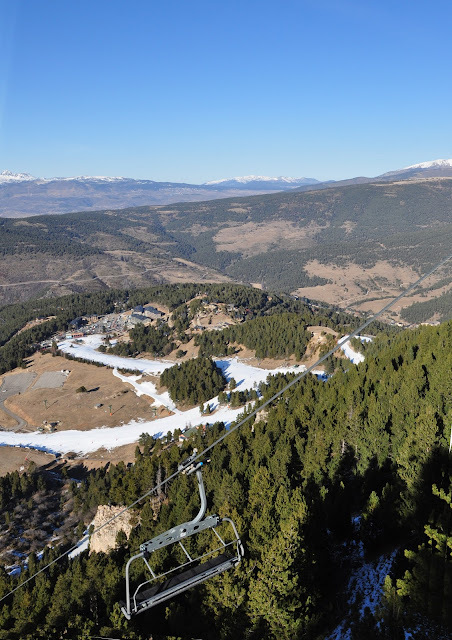 The maximum vertical difference at La Molina is 745 meters. The ski area map can be found here. Due to our late arrival, we only had time to try the left hand side, however. 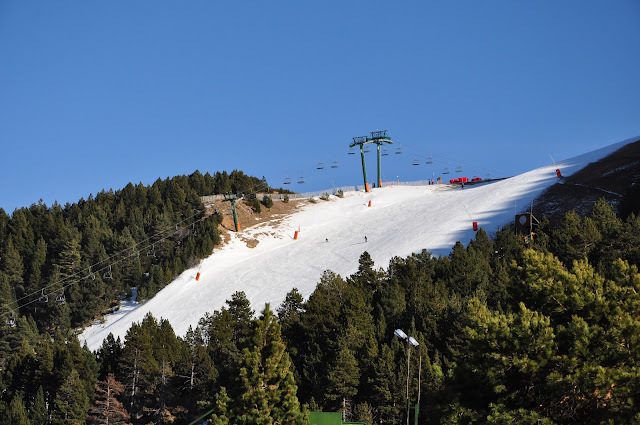 The skiing is on the Puigllancada mountain. We skied the runs from the Cap de la Comella chair lift. 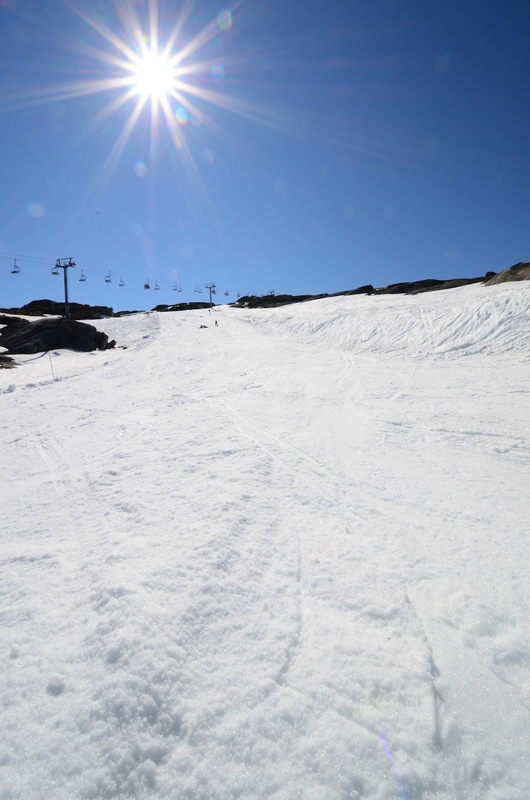 The red runs from the top are steep enough to be interesting, and the well-maintained slopes were a pleasure to ski. Be careful about the "rock burn" if you venture outside the ski slopes in La Molina. There's no snow. 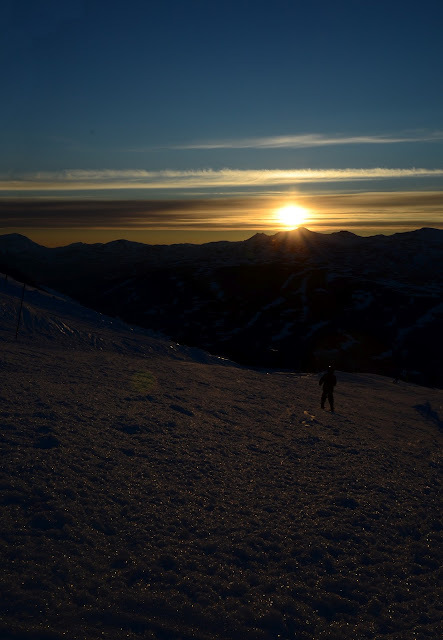 To be honest, I do not have a full picture the after-ski possibilities in La Molina. They seemed somewhat limited, but we also did not have time to stay very late, so the situation might have been different in the night. But right under the ski slopes, on the other side of the parking lot we found Snow Esqui, a small bar that serves food and drinks. It seemed OK. Curiously, there entire ski area was lacking the crowds, so the bars were also fairly empty. Maybe the people would have returned later in the evening, or maybe we visited the area on the wrong day. 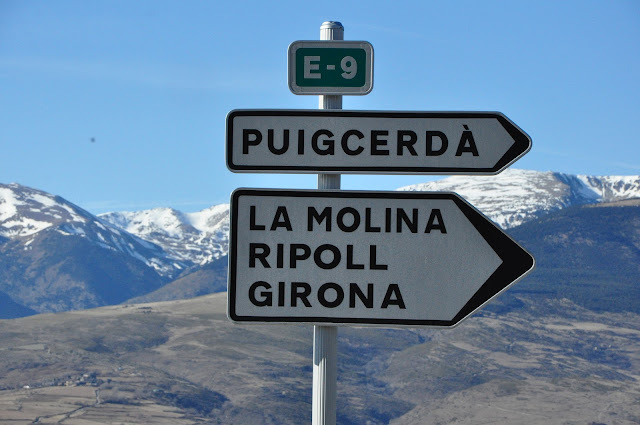 La Molina is two hours from Barcelona by car. It is reachable with normally equipped cars, as the roads are very likely in good condition year around. Abandoned border hut. Sweden's borders are open for invasion! Many of my friends are regulars at Riksgränsen. But I had never been to this place that calls itself "Sweden's most legendary ski area". The legends are true. It is an amazing place. For starters, we were there in midsummer, skiing at midnight. In bright sunshine! The ski area is far above the arctic circle, and for about two months in the summer the sun does not set. For instance, the picture above was taken at 1 AM. Be there light or not, the mountains around Riksgränsen form a playground that offers an exceptional choice of activities. 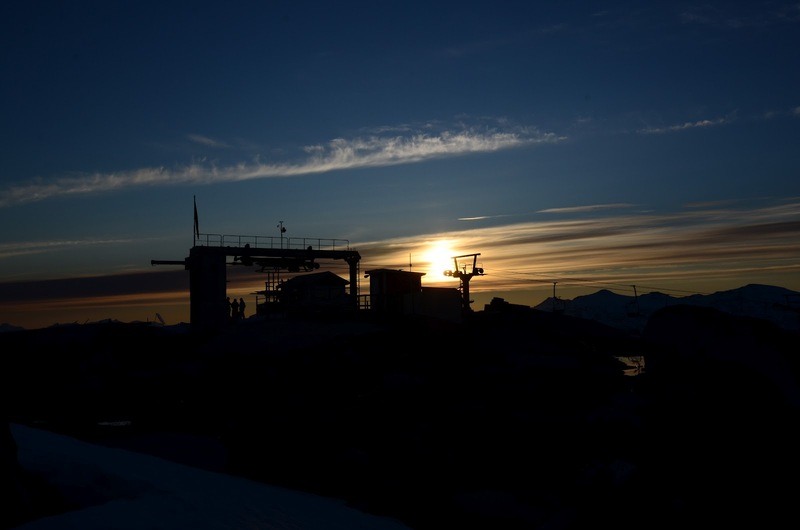 The ski lifts for "night" skiing open at 10PM and close at 1AM. This had some interesting effects. First, my ski days in a typical resort involve skiing during the day, followed by after-ski, shower, and dinner. And possibly some more after ski after that. But at Riksgränsen the ski lifts were open both during the day and the night. At the time that I would normally consider going to bed after a tiresome day of skiing, I now had to start putting on ski gear for another shift. Followed by another round of shovering, clothes changes, and, naturally, after-ski. The second effect relates to the after-ski part. After the last ski lift ride up, we always ended up climbing up a bit, taking some time to come down, and then getting a quick shower and change of clothes. But by then the clock was pushing 2AM, and I would only get to the after-ski place to hear the last couple of songs from the band. It is weird that ski area did not prolong the opening times of their bar based on when the skiing was actually open. 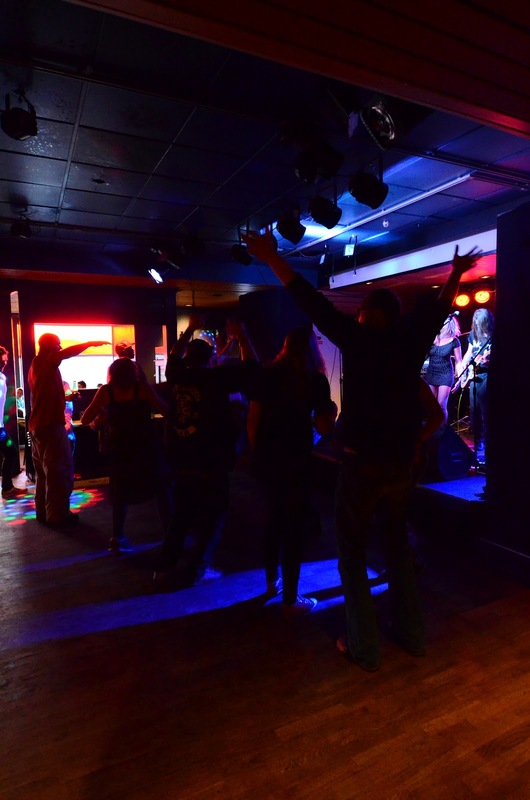 But it could be that their liquor licenses do not allow later closures. 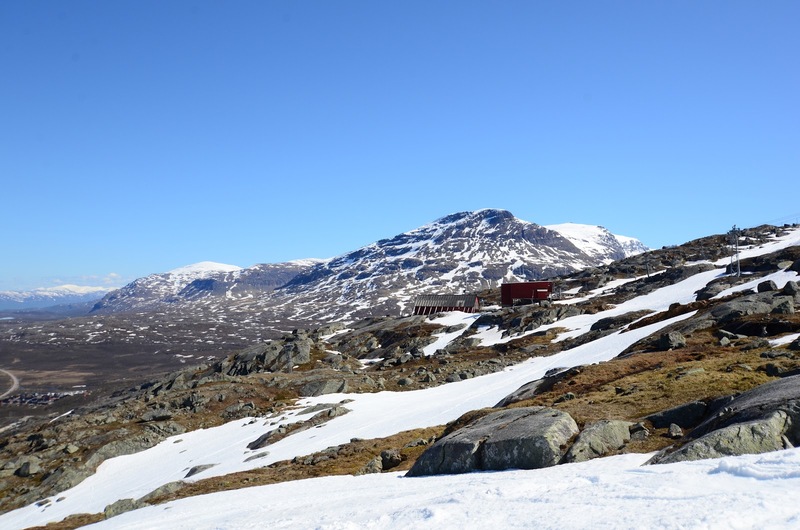 Riksgränsen has six ski lifts, two of which were operational on our midsummer visit. The ski area itself is relatively small by world standards. 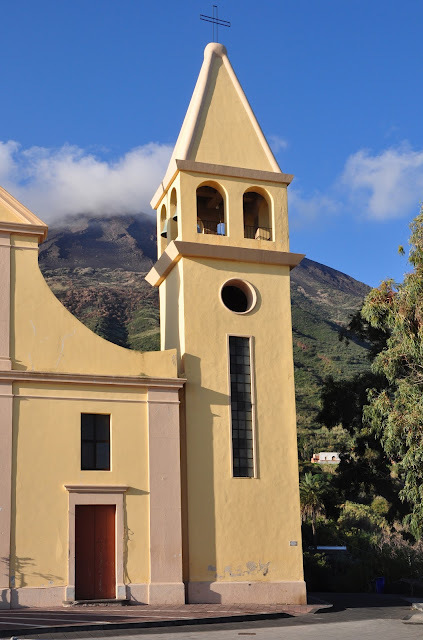 It offers a 500 meter altitude difference from the top of the mountain to the base. 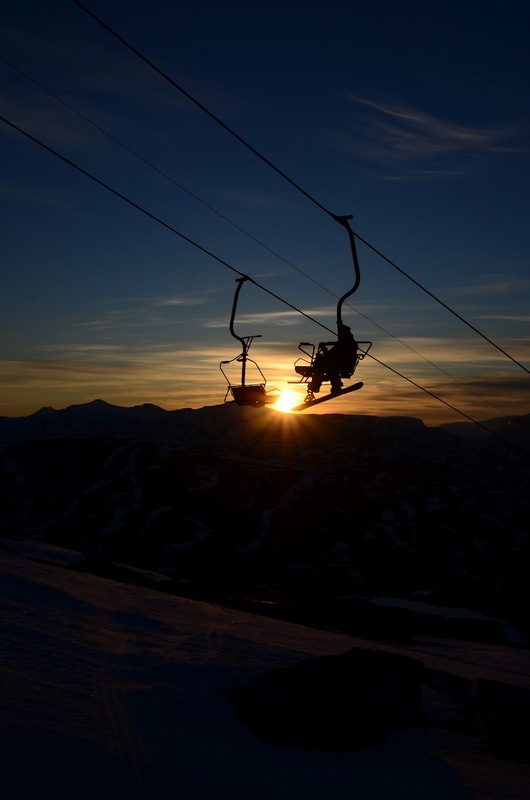 However, the skiing is exceptionally interesting for a variety of reasons beyond the midnight sun. The nearby mountains (such as Nordalsfjäll, 1051 m) are easily accessible for off-piste adventures. 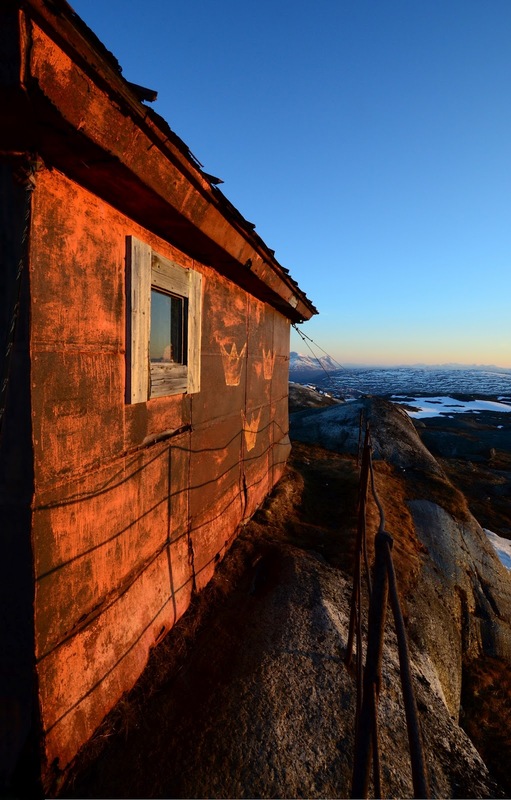 The Rikgränsen mountain itself offers a small detour to reach an abandoned border control hut at the top of the Riksgränsfjället (909 m). Sweden apparently trusts that no military invasion is imminent from Norway. In fact, as the name of the ski area ("riksgränsen" means "national border") implies, the area itself extends to both Norway and Sweden. 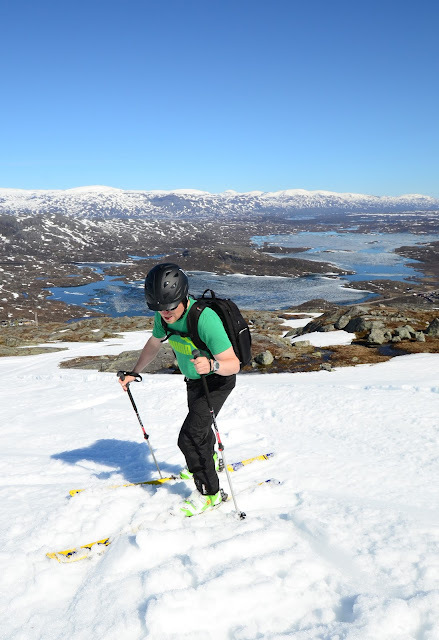 As we skied down "Gränsleden" (border run), we could visit both countries on every turn. There are plenty of organized tours for the off-piste. 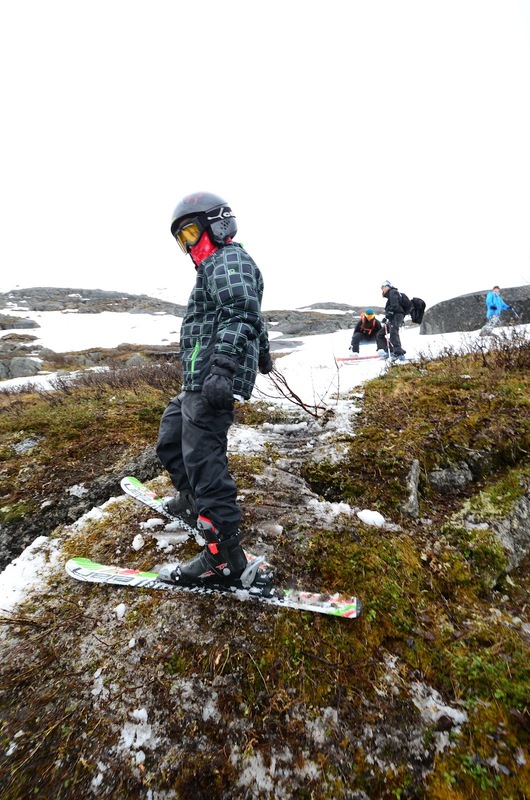 Riksgränsen also provides heli-skiing, snow and avalanche courses, and snowmobile tours. They even offer caving tours at the nearby Kåppasjåkkagrottan, the largest cave in Sweden. 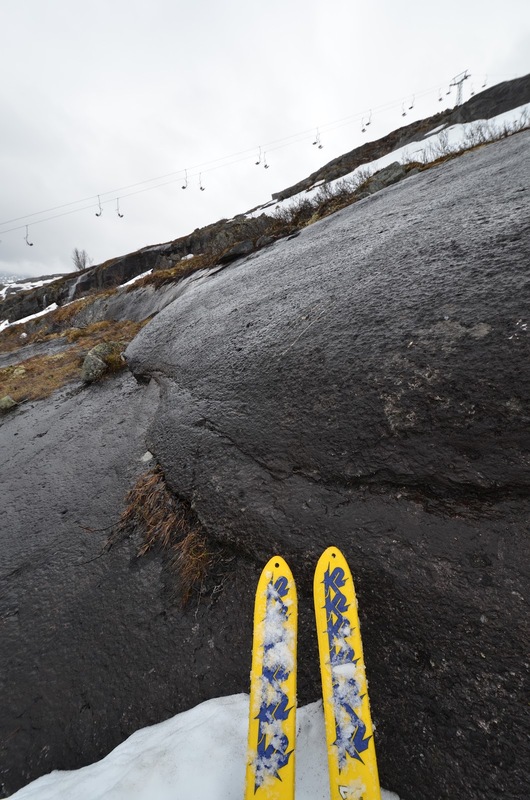 At this time of the year, the ski runs offered challenging route finding. You have to navigate between the rocky areas to find to the bottom. 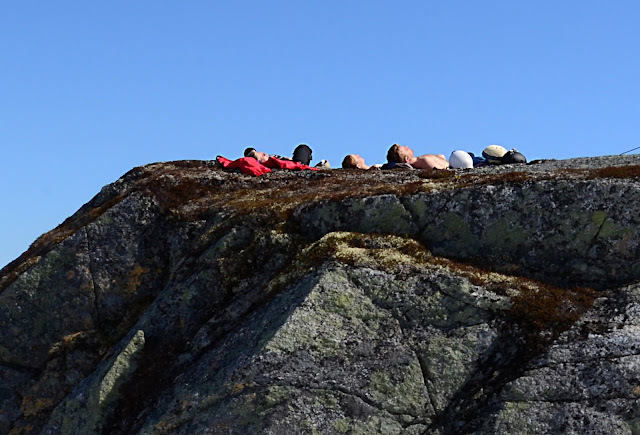 On the lower part of the mountain there were a couple of sections were we had to cross rocks covered by moss. 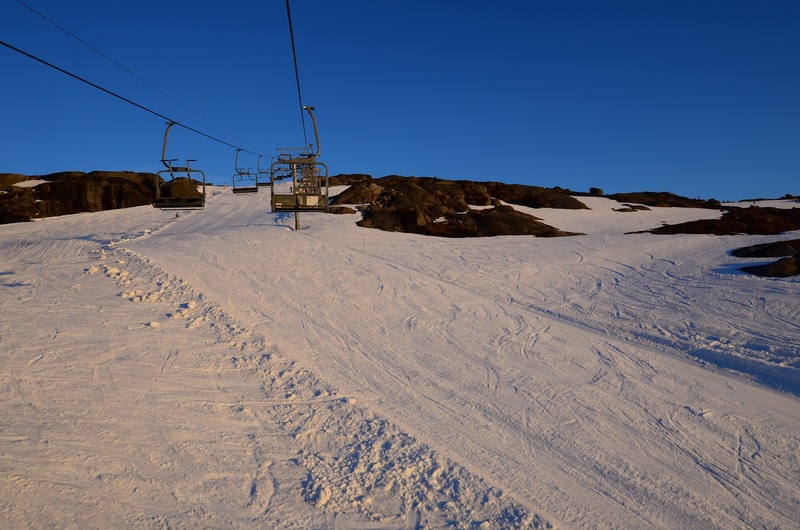 On the upper part the ski runs were still in excellent condition and easily identifiable. In fact, during the "night" time the ski runs iced up and allowed us to start our 10 PM ski run on freshly groomed, hard surface. 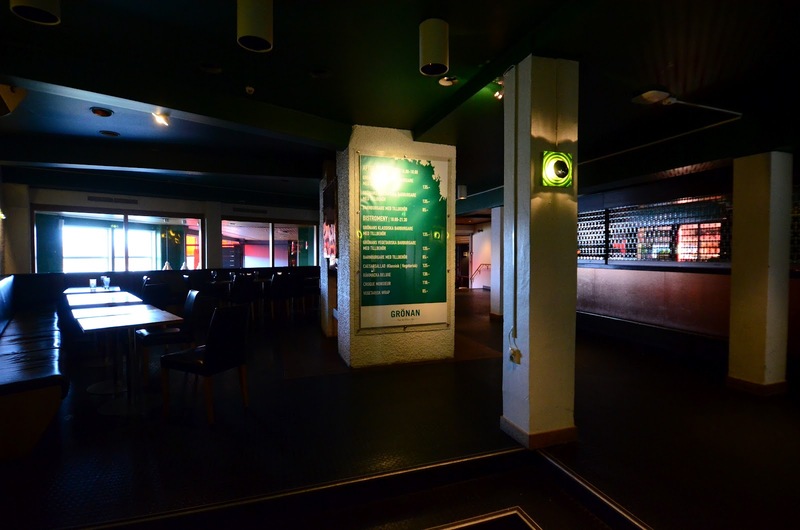 The primary place for after-ski in Riksgränsen is Grönan, a small club in the basement floor of the main hotel. Actually, it is the only place. 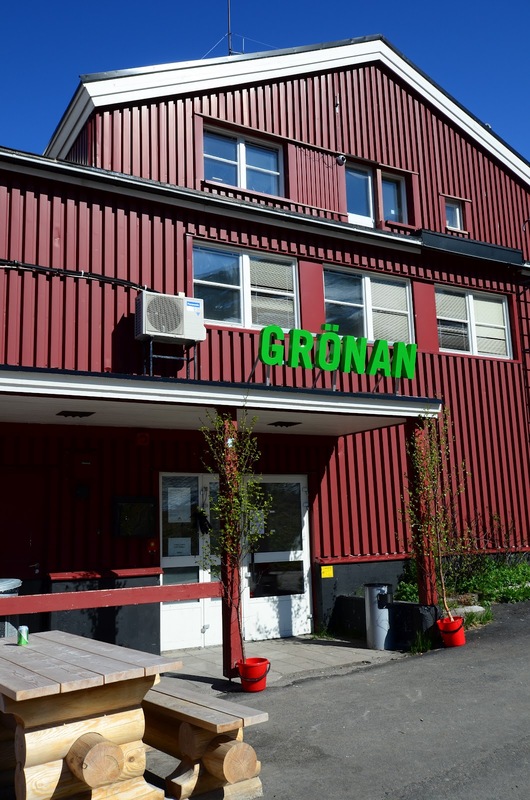 Grönan opens at 4PM and continues until about 2:30AM. They drinks as well as food. Well, at least they have two different snacks, a hamburger and a Caesar salad; I recommend the latter. 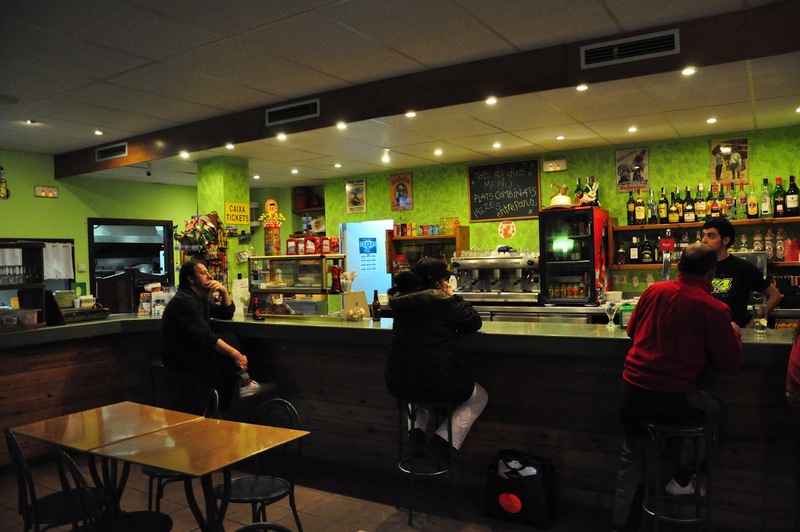 The bar seems completely empty for most of the night, except at the beginning of their opening times and then very late in the evening. At least during the midsummer they had a live bind playing until about 2AM. Grönan at 6PM. No one! Grönan dance floor at 2AM. Note the sun shining through the window. 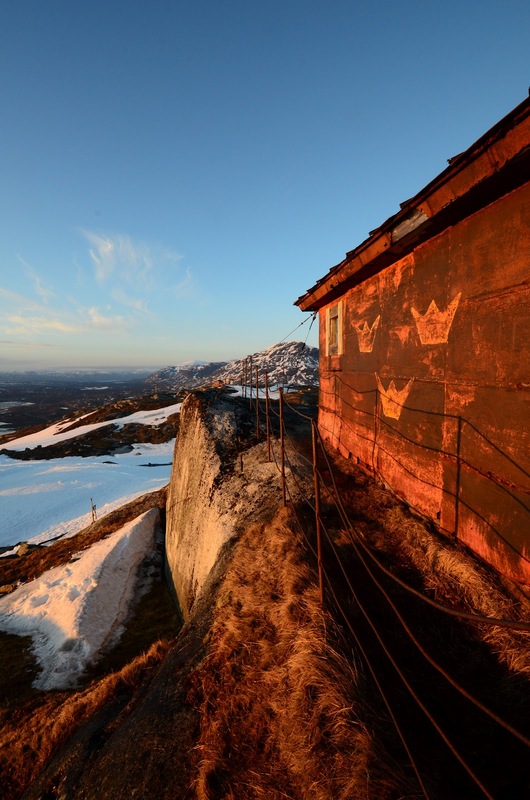 There are a couple of accommodation options in Riksgränsen, but the most obvious one is the Rikgränsen hotel. This is the main building in the area, a clean and comfortable hotel a couple of hundred meters from the ski lift. We stayed in a "skier's room", a tiny but OK room for up to three persons. While the relatively expensive price is not necessarily aligned with the quality of the accommodation, you have to factor in the remote location. 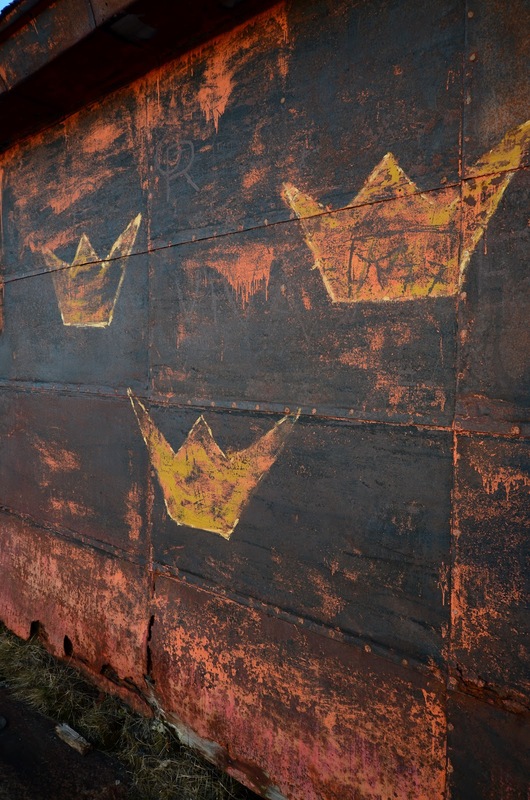 In any case, the half-board accommodation option is quite reasonable, and lets you eat in the Restaurant Lapplandia. The dinner food is good, particularly the cold fish and other appetizers. 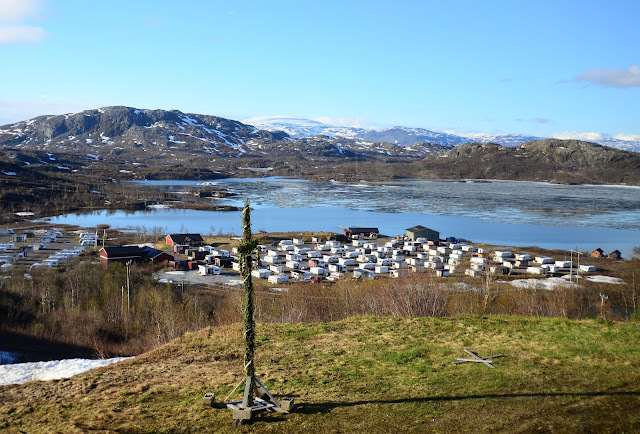 There is an adjoining older building for a more traditional Swedish style accommodation, a series of chalets, and a camping area. I would not recommend staying in a tent in the camping area, however, as the place is quite cold. 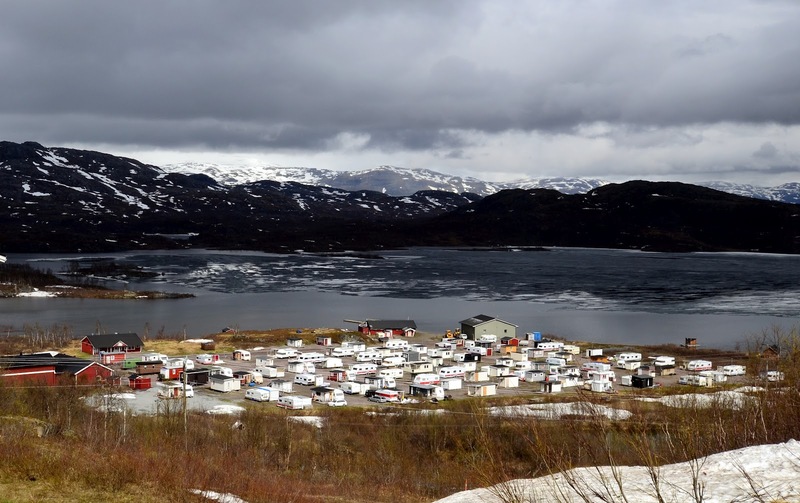 The camping area sits next to a half-frozen lake even during midsummer. The chalets appear to be quite far from the ski slopes, so count on driving up to the hotel on your car before starting your daily dose of skiing. And then there is a spa in the hotel. Entrace is not included in the hotel price, and you have to pay roughly 20€ extra per person. But this is well worth it, given that the bathrooms in the rooms are tiny. There's a nice sauna, Jacuzzi, and a small pool for laps. Don't bother paying extra for that hot tub, the Jacuzzi is equally good. 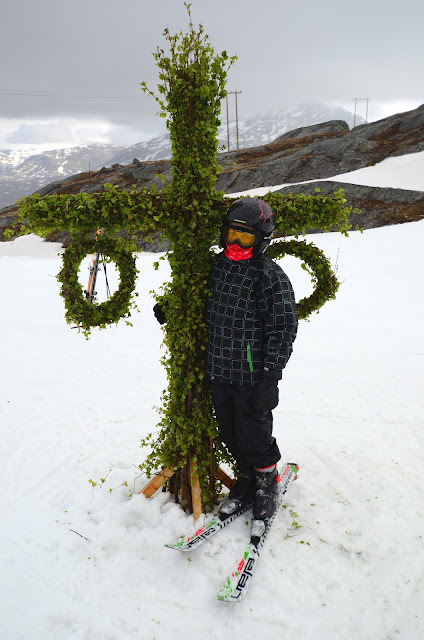 The Swedish midsummer traditions are interesting. 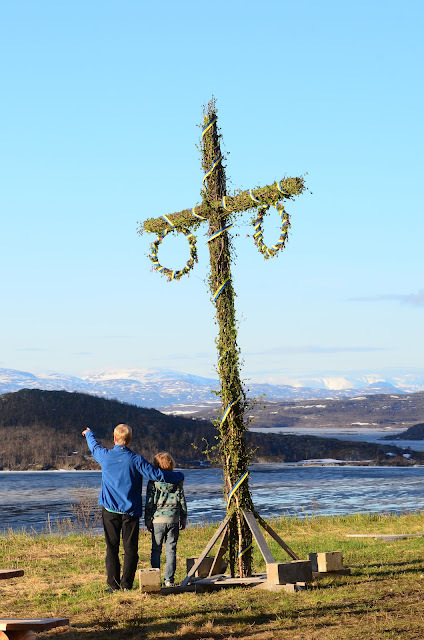 Apparently, in Sweden the idea is to raise a "maypole", a birch-tree decorated cross and then dance around it. 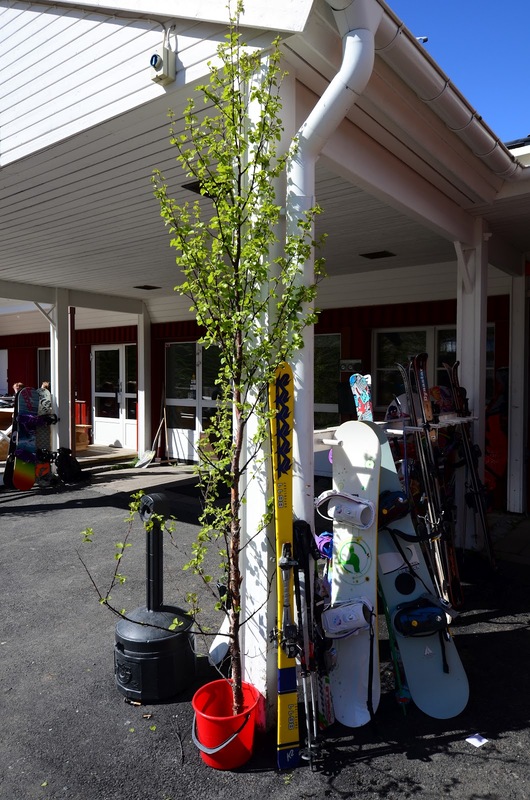 This is an interesting difference to Finland where we do decorate with birch trees, but mostly spend the midsummer in saunas and drink even more alcohol than usual. The midsummer celebrations seemed muted, at least in Riksgränsen. Maybe the wild midsummer parties were elsewhere. The winter season at Riksgränsen ends in late May, but they re-open for midsummer, which was June 21-24 this year. Judging from the amount of snow available, there could be skiing year around, at least if one is willing to hike a bit. T-shirt, snow, midsummer. And great views behind. 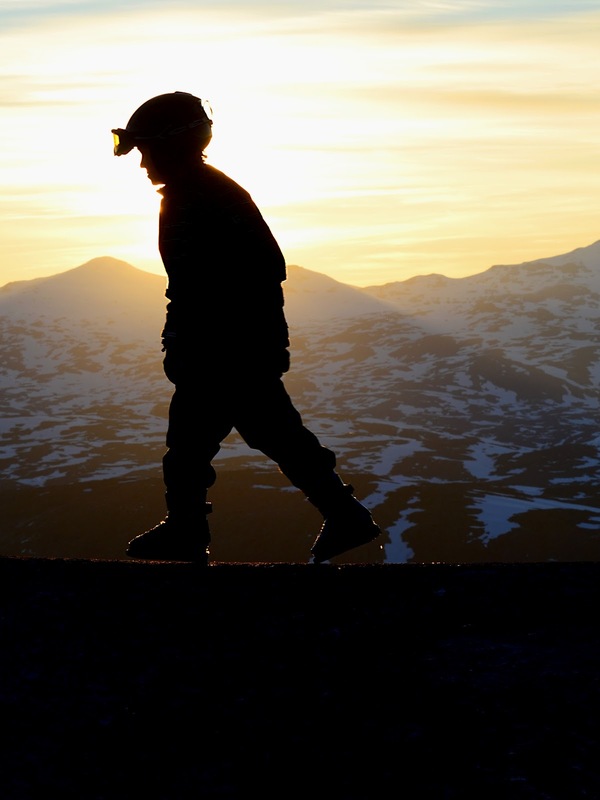 Riksgränsen can be reached in multiple ways, airplanes or train via Kiruna, or by car if you are willing to spend a long time driving up there. But we chose to fly through Norway, landing at the Evenes airport that serves the cities of Narvik and Harstad. 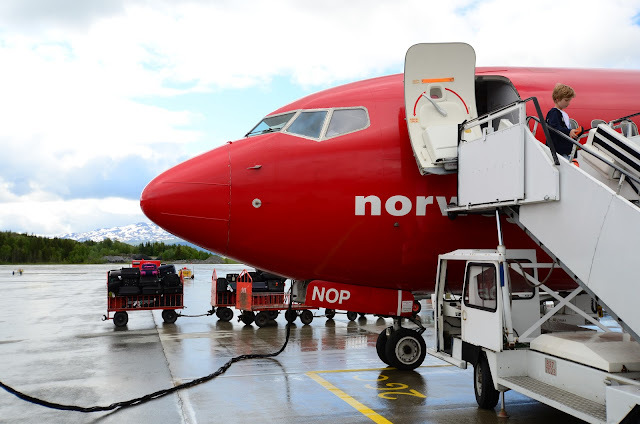 We used Norwegian flights, which meant that we had to change planes in Oslo. That turned out to be a near-disaster. At the Oslo airport, you have to walk a kilometer to exit an incoming flight from another country. And then you have to wait for your luggage to arrive. This is normal on many airports, but usually there will be a luggage re-check point right after coming out of customs. In Oslo, however, you have to walk another kilometer to the same check-in area that everyone else uses, and it was so crowded that even moving around was very difficult. We eventually pleaded entrance to Norwegian's special-service check-in line and checked in our luggage 25 minutes before our flight was scheduled to depart. And spent the next fifteen minutes in security check, with a long line and someone's drama scene with the security personnel. We got through, and then ran yet another kilometer to the gate. We made it. What is even more surprising is that our luggage made it. But I'll never transfer again in Oslo, and I don't recommend it for others either. From the Evenes airport we rented a car and drove 80 kilometers (1 hour and 20 minutes) to reach Riksgränsen. Don't drop your camera on your ski binding!